A (New Zealand) waitress put years of karate training to the ultimate test when she floored two male attackers twice her age with a set of cleverly-placed punches. The 18-year-old was walking home from a night shift in central Wellington on Saturday morning when she was set upon from behind by an unsuspecting older man. “She’s been doing karate for about seven years, so she elbowed him in the chest and stomped on his foot,” Detective Sergeant Shane Dye told the Dominion Post. “She was then attacked by a second male who she hadn’t seen, and he began to pull at her handbag, then she punched him in the stomach” before escaping. The officer admitted he was “well and truly impressed” by her show of martial arts skill. Ring them bells! No. Wait. Don’t ring them bells. A group of professional bell ringers was locked up in a British church tower by a fed up senior citizen. The team had travelled from the south of England to the northern English village of Sharow to practice a three-hour peal, but the man – believed to be a local resident in his 70s or 80s – took offense to the noise, The York Press reported today. He confronted the group in the belfry of St. John the Evangelist Church and threatened to damage their cars before lodging the door to the tower shut with a piece of wood. 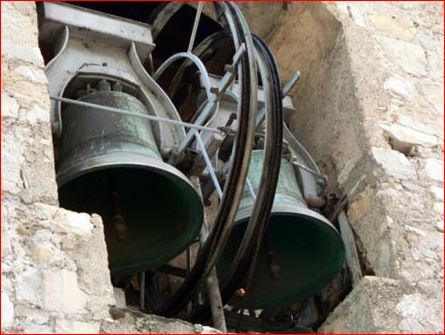 The bell ringers were trapped inside the tower for half an hour, until a member of the church heard banging from the trap door. 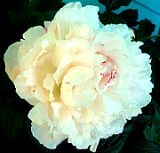 July 7, 2011 Posted by oldstersview | Dumb Stuff	| Comments Off on Ring them bells! No. Wait. Don’t ring them bells. 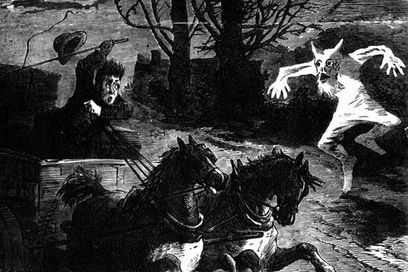 In 1871 and 1872, there was a series of ghost scares in Peckham, south London, and its vicinity. In November and December 1871, a ‘ghost’ had been breaking windows at night, but this vandalism ceased after the arrest of a ‘foreigner’ with a catapult. In April and May 1872, there was another window-breaking epidemic, which was blamed on a 13-year-old girl named Nott, who was caught red-handed and severely fined the month after.